the Sooners reclaimed the league throne. What does 2011 have in store for the most unstable league in college sports? Let's peer into our cloudy crystal ball. 1. Texas will look a lot more like Texas. 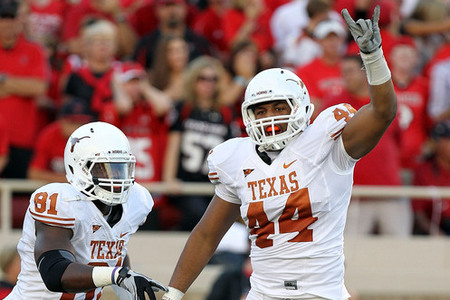 Hate to burst your bubble, Sooner Nation, but Texas will resume bowling this season. Coach Mack Brown has hired a new crew of young whippersnappers to inject some life into a program that scraped bottom last year. Job No. 1 will be revamping an offense that fell apart under now-departed offensive coordinator Greg Davis. Enter new play caller Bryan Harsin, who studied for the last five years under one of the most inventive offensive minds in college football, Chris Petersen. That's a good start. The Longhorns still have talent to burn, too. UT won't be playing for the national championship this season. However, there's nowhere for UT to go but up after last season's implosion. At worst, look for the Longhorns to rack up nine wins behind a defense led by the Big 12's top defender, edge rusher Jackson Jeffcoat. 2. Kansas State will not draw an excessive celebration penalty all season. Bill Snyder already hated having fun enough before that. 3. Offenses will put up 2008-like numbers. Then, consider that defensive-minded Nebraska has left for the Big Ten. 4. Baylor will notch one of its biggest wins ever in the season opener. Despite 2010 being one of the best seasons in the Bears' uninspiring history, Baylor proved it's still the same old Baylor. The Bears limped to the finish line in 2010, including a horrendous performance in a blowout loss to Illinois in the Texas Bowl. Last year at Amon Carter Stadium, TCU laid a 35-point beatdown on the best Baylor team in recent memory – why should we believe this year will be any different? Well, the Bears return a boatload of talent on offense, including standout quarterback Robert Griffin. Meanwhile, the Horned Frogs lose a ton from a team that was built to win big in 2010. Waco is no snake pit, but it's not ideal for a team that will be as inexperienced as TCU. Art Briles' team will take advantage of some youthful mistakes to pull off the shocker. 5. Oklahoma State's prodigious offense won't miss a beat – yet. OSU's losses on the offensive side of the ball are big, starting with two-time All-American Kendall Hunter at running back. After a successful rookie year coordinating the Cowboy attack, wunderkind Dana Holgorsen took his offensive acumen to West Virginia, where he'll succeed Bill Stewart as head coach in 2012. In a less publicized move, Ole Miss snatched away receivers coach Gunter Brewer, a crackerjack recruiter and talented coach who has helped turned Stillwater into a mecca for pass catchers. Coach Mike Gundy has yet to name their replacements. Yet, unless he decides to make radical change to the O, the Pokes still have enough weapons to match the 2010 team point for point. There's first-team all-conference quarterback Brandon Weeden. He'll be throwing to four of his top five receivers from a season ago, including the Big 12's reigning offensive player of the year in Justin Blackmon. The two-headed combo of Jeremy Smith and Joseph Randle at running back gives OSU a nice inside-out duo in the ground game. To top it all off, the Cowboys return five starters on the offensive line. With all that firepower, 2011 looks to be in good shape. Gundy just needs to worry about making the right hires to ensure OSU can keep it rolling in 2012. 6. The freshman running back who makes the biggest impact won't be Malcolm Brown. News flash: Mack Brown landed the top recruit in the state of Texas! What actually is surprising is that Malcolm Brown is a running back, a position where the 'Horns have struggled to attract top-shelf talent lately. Turns out that the Lone Star State has enough room for two diaper dandy runners, though. The Oklahoma Sooners landed late-blooming stud Brandon Williams, who enrolled at OU this month and will go through spring drills with the rest of the squad. DeMarco Murray and Mossis Madu are graduating and taking nearly 60 percent of OU's 2010 carries with them. Explosive sophomore scatback Roy Finch led the Sooners last season with an average of 4.7 yards per carry and will be the lead back in the fall. However, Finch's durability issues make identifying a strong No. 2 who can split carries paramount this offseason. Williams' early arrival will put him squarely in the mix from the jump. Brown will see his share of carries for UT. However, Williams is stepping into a better situation. If he lives up to billing, he could be the first true freshman to lead OU in rushing since Adrian Peterson. 7. Texas A&M won't live up to the hype. It seems like there's at least one every year - Nebraska (2010), Ole Miss (2009), Missouri (2008), etc. A team sneaks up on everyone one year and finds itself ranked in the preseason top 10 the next. A&M has that look this year, with pundits already touting the Aggies as a legit contender for the national championship. Once coach Mike Sherman made the call in 2010 to put Ryan Tannehill under center around midseason, the Ags played like a team reborn. Unfortunately for the dark horses, it rarely works out all that well. A&M won't be any different. The offense shouldn't suffer any drop-off, but the D will take some steps back. Replacing standout linebackers Von Miller and Michael Hodges will prove awfully difficult. Plus, as good as defensive coordinator Tim DeRuyter is, teams will adjust to his unique 3-4 defensive scheme a year later. A three-game stretch beginning in late September against Oklahoma State, Arkansas and Texas Tech will yield at least two losses and precipitate a quick slide down the polls for the Ags. 8. James Franklin will be the league's breakout star. Blaine Gabbert's early exit from Columbia would appear to leave a huge void in the Missouri offense. Until you remember that Gary Pinkel grows prolific passers on trees. The word coming out of Tigerland is that Franklin is the odds-on favorite to win the quarterback job. While Gabbert and predecessor Chase Daniel could occasionally do some damage with their feet, Franklin is a true dual threat behind center. That gives offensive savant Pinkel a new weapon that he can use to torment opposing defenses. Franklin will have the benefit of playing with a seasoned group of performers at the other skill positions, including Michael Egnew, T.J. Moe and Jerrell Jackson. He'll put up huge numbers and have the Tigers near the top of the league. 9. Kansas will get a lesson in the rigors of playing nine conference games. The Jayhawks should give Washington State a call to find out what playing a round robin schedule in the Pac-10 has for like for the Cougars. Essentially, it means goodbye to a gimme win and hello to another likely loss for the dregs of the conference. Even worse for KU, underachieving Colorado, who the Jayhawks have beaten in four of their last five meetings, has left the conference. Also, they now have to play the entirety of the Big 12 South. If Turner Gill thought he had inherited a tough gig after Mark Mangino nearly sunk Kansas' program, well, he ain't seen nothing yet. 10. No head coach will lose his job before, during or after the season. Last year at this time, Dan Hawkins was a dead man walking in Boulder. The pressure was building on Mike Sherman to put it together at A&M. Even Head Poke Mike Gundy felt his seat getting a little warm. Twelve months later, all is calm on the conference's coaching front. Sherman and Gundy bought themselves some time with strong seasons. Meanwhile, Kansas has to cut Turner Gill some slack after inheriting a dumpster fire in Lawrence. Texas Tech probably didn't live up to expectations in Tommy Tuberville's first season, but it's way too early for there to be any calls for his head. Oddly enough, after the way 2010 turned out, you could argue the Big 12 coach feeling the most heat is Mack Brown. However, Mack took evasive maneuvers in the last few months to fend off the barbarians at Bellmont's gate. Will Muschamp's departure for Florida also took the most plausible replacement off the table. Given the state of play, Mack may be as entrenched as ever in Austin. Bonus: Another year, another Big 12 championship for Oklahoma. The more I scrutinize OU's bona fides, the more I question the installation of the Crimson and Cream as the clear favorite to win the league, let alone the national championship. Last season, the offensive line still couldn't run block. The defense and special teams gave up way too many big plays. Landry Jones threw some head-scratching interceptions at inopportune times. But, as far the Big 12 goes, if not OU, who? The defending champs may have flaws, but they are still the most complete squad in the conference. The Sooners also have a favorable schedule, catching revenge games against A&M and Mizzou in Norman. The toughest true road test in league play appears to be the regular season finale against OSU in Stillwater, a team OU has beaten eight straight times. Oh, there's no conference championship game to win, either. May not be bold, but that doesn't make it any less right.